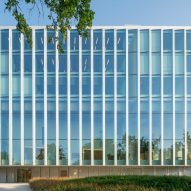 Architect Rob Hootsmans has renovated a 1970s courthouse in the Dutch city of Zwolle and added a "transparent and approachable" extension featuring sawtoothed glass facades. 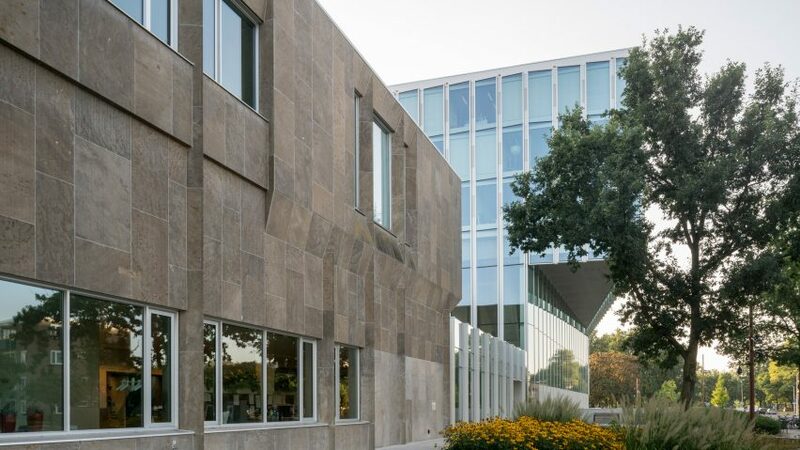 Zwolle's existing courthouse was designed by architect Jo Kruger in 1977 and features robust, sculpted facades clad in chalk stone. 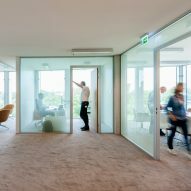 Hootsmans' Amsterdam studio was asked to sensitively restore, upgrade and extend the architecturally significant building while facilitating its continued use throughout the renovation process. "Our task was to reinstate the original architecture of the building, to comply with current building regulations and safety measures, and provide for a substantial extension," Hootsmans told Dezeen. "We made a design that connects the existing building and the extension in a logical and self-evident, functional manner." The project team developed a proposal for a large extension that is connected to Kruger's building at ground-floor level. A new entrance is accommodated between the two structures, along with a patio incorporating a large artwork. 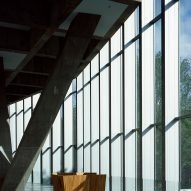 The appearance of the new structure provides a counterpoint to the 1970s block, with extensive glazing lending it a lightweight and permeable character. 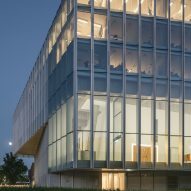 "The existing building is mostly introverted, with its public plazas as large interior spaces," said the architect. 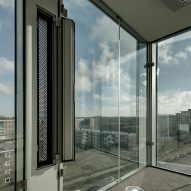 "The extension expresses a more modern interpretation of the justice system, being a transparent, approachable and clear structure, directly visible from street level and orientated on the surroundings," he added. The extension is accommodated on a plot dictated by the existing boundaries and mature trees, which helps it to feel a part of the urban fabric. 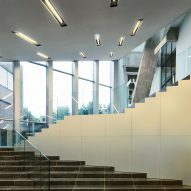 Its design comprises three distinct segments, each of which is expressed using different materials and construction methods. 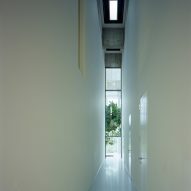 An opaque pedestal surrounding the base contains the main entrance and facilities including an archive, prison cells, storage and technical areas. Double-height spaces on the first floor contain waiting areas and courtrooms, as well as the council chambers and library. 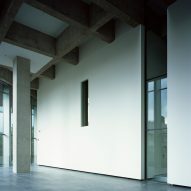 A series of slanted concrete columns that punctuate this level support the three storeys of private offices at the top of the building. The serrated facades of the extension are wrapped in glazing that produces shifting reflections of the surroundings and sky. "The serrated profile of the facade with its 10-degree angles is derived from the angular layout of the existing building," said Hootsmans. 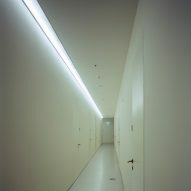 "The layout of the public spaces and courtrooms in the new building, on the other hand, is the direct opposite from the existing building," he continued. 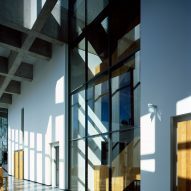 While the external appearance and layout of the extension contrast with Kruger's building, the materials and forms used internally ensure continuity between the old and new parts of the courthouse. An even older former courthouse building in Zwolle now houses an art museum, with an ovoid-shaped extension perched above its neoclassical facades. Photography is by Rob Hootsmans unless otherwise stated.